Halloween, the most wonderful holiday of all, might be over, but Christmas is right around the corner. 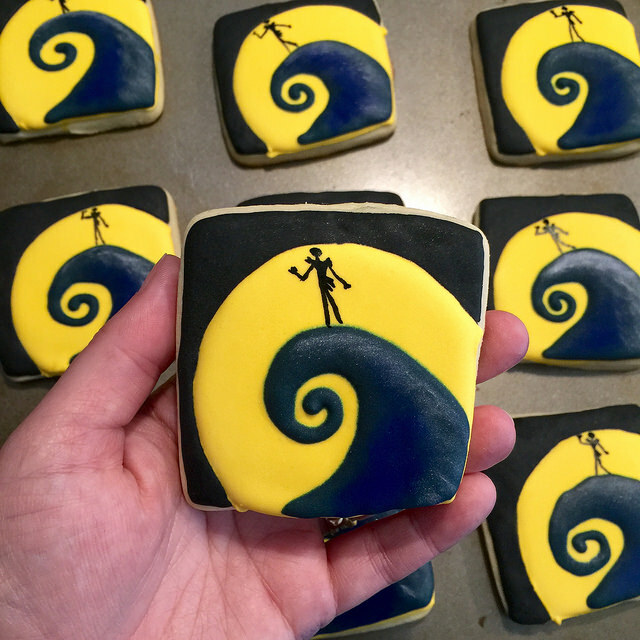 And these cookies pay homage to one of the best holiday movies of all time — Nightmare Before Christmas! About a year ago, my best friend was soon to have a new baby, and his nursery would be themed from the movie, complete with a full wall mural of the scene where Jack is silhouetted on Spiral Hill in front of the moon. 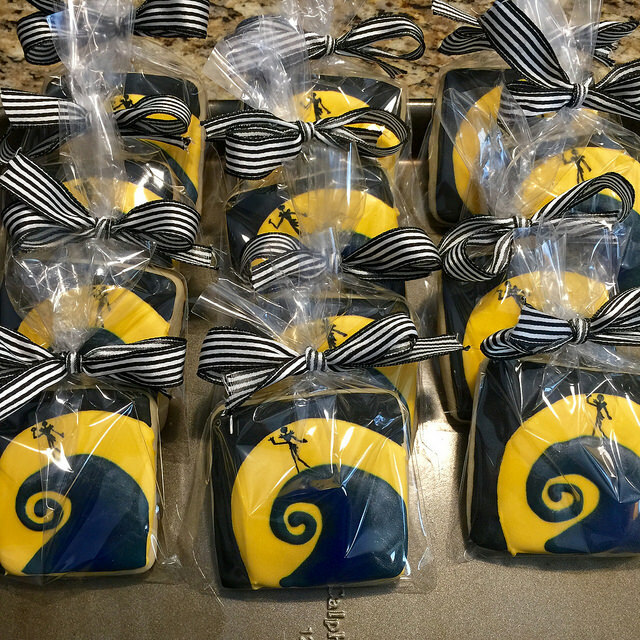 I was elated when she asked me to make similarly themed cookies for her upcoming baby shower. Because she lives several states away and I was unable to attend the shower in person, I had to ship the cookies to her. 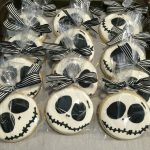 Royal icing decorated cookies can easily be shipped since the icing dries hard and sugar cookies are quite durable. But as an extra precaution, it’s best to choose simple cutout shapes with no thin appendages. 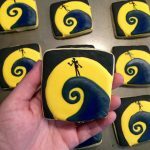 So for that reason, I chose two simple designs — Jack’s face on a round cookie and the Sprial Hill scene on a square cookie. For packaging, rather than tying off my bags with a standard twist tie, I bought some cute black and white ribbon that reminded me of Jack’s suit. 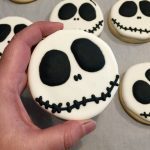 I was super happy with how these cookies turned out, so I was even more excited when, back in April, another friend and coworker placed an advance order for October for two dozen cookies of these same two Jack Skellington designs. He’s an avid runner, and he had put together a Ragnar team for a relay last month. 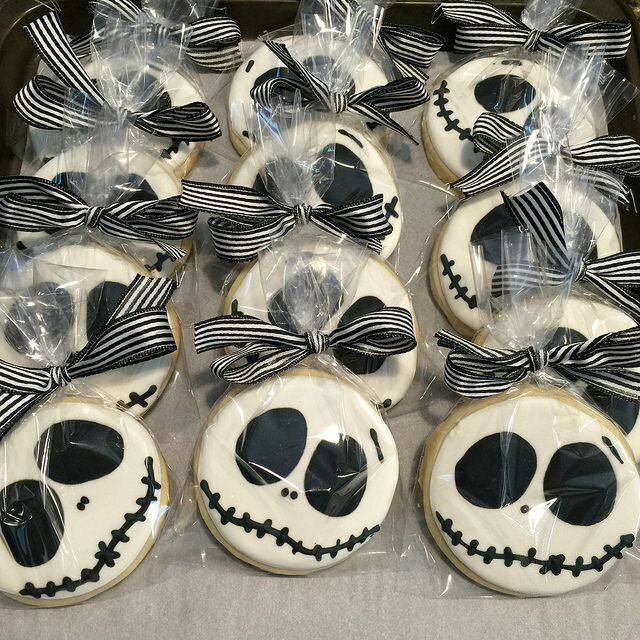 Their team’s name was Nightmare Before Ragnar, and they had Jack Skellington shirts made for the event, as well. 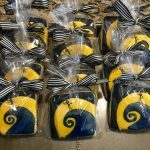 These cookies were for the after-race celebration! 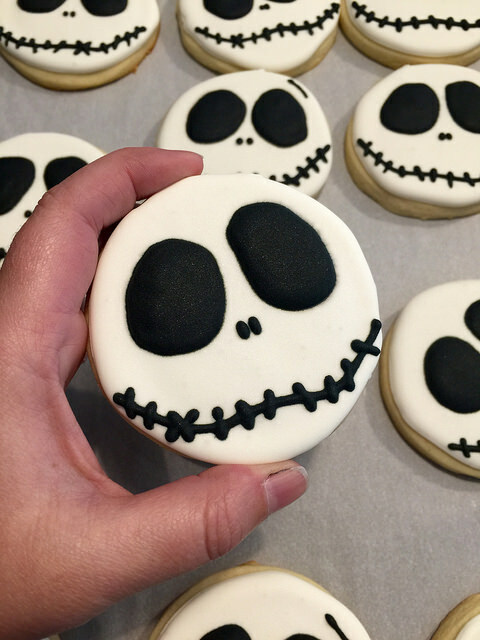 I hope you enjoyed watching me recreate this set of cookies, and I hope it inspires you to try cookie decorating for yourself! 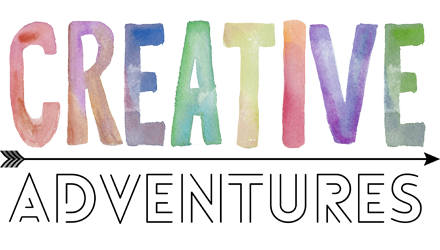 As always, if you have any suggestions for future crafts to try or have questions on any of the techniques in this video, let me know in the comments below. I’d love to hear from you!